The social-economical role of medieval pilgrimage souvenirs in the Mediterranean area. Souvenir stand in London. Image: google advanced search. If you have ever been on a holiday or if you studied abroad, chances are you brought a souvenir of that place, so you could recall the great memories when you’re home. Maybe you’ve brought home a stone or shell, a beer math or collected your travel tickets. Maybe you went on a hunt for the cheesiest and ugliest souvenir you could find! (I tend to do so. My parent’s aren’t always too fond of this habit.) Sometimes people decide to make a permanent mark of their journey on their bodies: they want to have a tattoo to remind them of the places they have visited. It can work the other way around though: some people bring a keepsake to a far country. They need an object to remind them of their home, to feel safe and avoid homesickness. All of this might sound familiar to you, but did you know all of this ‘travel traditions’ go centuries back? The pilgrimage of Grace, 1536. Image: google advanced search. Since the late Roman times, travelling in the Western world did not only had a mere commercial or political (war) background. Until the high Middle ages, crusades and pilgrimages were very common: if you went on a crusade or pilgrimage, you could spread the word of Christ the Saviour and therefore get rid of all the sins you committed. Pilgrimages to popular holy places, like Santiago de Compostela, Rome and Jerusalem were for a lot of people the only way to see something more of the world. In example: for women, a pilgrimage was the only excuse to travel alone. (The book of Margery Kempe will tell you all about women pilgrimages!) It may actually sound quite emancipated, but you shouldn’t forget travelling in the Middle Ages wasn’t too safe and chances were you didn’t reach you destination at all. You could get robbed, shipwrecked or encounter other bad stuff. Too bad back in the days pepper spray and life jackets didn’t exist, isn’t it? If there was no opportunity for you to go on a pilgrimage, you could always go on a virtual one. Therefore you should imagine the passion of Christ so vividly as if you were there yourself! If you did so, you could also receive forgiveness for your sins and increase the chances you would go to heaven instead of to hell. Virtual pilgrimages were for example popular in closed monasteries. Pilgrim badge of the Holy Virgin and Child. If you were on a pilgrimage, it was common to bring home a sort of souvenir, just as we do nowadays. But there are some differences between Medieaval pilgrimage souvenirs and the souvenirs we know now. For instance: pilgrim souvenirs, are commonly known as pilgrim badges. They were produced en masse and worn on the clothes or hat of the pilgrim. The iconographical theme of the badges varied and depended on the places visited. The badges had a variety of functions: for instance as a talisman, to show your political view or to proof you had been to that place. Some pilgrims even took their badges to their graves to proof they had been on a pilgrimage! You could state pilgrim badges were treated quite seriously back then. Nowadays, most souvenirs are only used for ‘the walk down memory lane’ and I can’t imagine myself taking a really ugly souvenir to the grave, do you? Or sew a ridiculous button to my shirt to show what political party I would vote for.. Oh wait, you can still do that nowadays. The topic I researched was the following: If souvenirs in the Middle ages and souvenirs nowadays differed so much, what was the exact difference? In other words: what social-economical role did the pilgrim badge play in the Middle Ages? I think it’s an interesting research topic, because if you compare the usage of souvenirs now and in the Middle Ages, there are some similarities, but also huge differences. Also, it is very interesting to investigate the different roles of the pilgrim badge: you can use a lot of sources for that. These sources are spread all across the western European and/or Mediterrenean area, but it is funny to know a lot of pilgrim badges are dug up in the Netherlands! Due to the wet climate and heavy clay soul, the lead-tin badges are quite well preserved: over eight thousand pilgrim badges are found in the past fifty years. Maybe we should add this to the most typical things about the Netherlands: windmills, weed, wooden shoes and really, really well preserved pilgrim badges. All pilgrim badges have different iconographies and even different functions. For instance, there are pagan badges and religious badges. During the pilgrimage they were used as proof for accomplishing the pilgrimage, as attribute of protection and recognizability, as a warning sign, as a way to show your political point of view, as decoration and of course as a souvenir. If you came home and had overcome all the bad stuff that could happen to you, you could always use the badge to protect you from illnesses and infertility. Not only the thousands and thousands of physical pilgrim badges are very interesting to investigate, but this form of craftmenship is to be found in other places too! You can think of images of saints, such as Saint Christopher, Saint Rochus and Saint Jacob. There even are famous portraits of rich men wearing their pilgrim badges. In other words: investigating pilgrim badges is more than researching a simple souvenir. Those badges were really hot items back in the days, and still are if you’d ask me. In that respect, nothing seems to have changed at all. 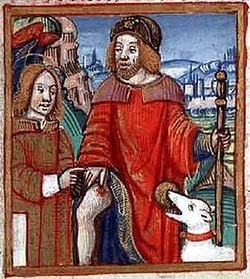 Koldeweij, A.M., Vrome Reiziger of Stoere Jongen: Pelgrimstekens en Profane Insignes, in: Transparant, Jaargang 13 (2002), no.3 – Themanummer Pelgrims in Middeleeuwen. Koldeweij, A.M., Laatmiddeleeuwse Insignes – verzamelgeschiedenis en stand van onderzoek, cultuurhistorische aspecten. In: Heilig en profaan, Laatmiddeleeuwse insignes in cultuurhistorisch perspectief. (Red: Koldeweij A.M. en Willemsen, A.) Van Soeren en Co, Amsterdam. 1995. Hall, J., Hall’s Iconografisch Handboek. – Onderwerpen, symbolen en motieven in de beeldende kunst.(red. Veldman, I.M. en Couprie, L.D. ), Primavera Pers, Leiden. 1996. Image sources: all images are found with google advanced to search for images that are free to use.